Blown Away combines the first two pitches of the classic West Crack with spectacular face climbing and mind-numbing exposure. A huge traverse pitch which is never too runout (but not exactly tightly bolted either) challenges the leader and follower. 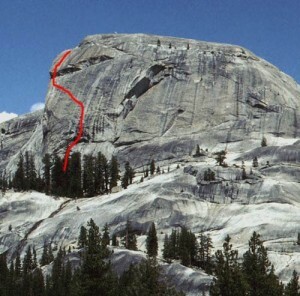 The first ascent team couldn’t believe that such a cool route could still be done on one of Tuolumne’s most popular domes in 2002. This, and a “little bit of wind” one day, inspired the name. Which SuperTopo guidebooks include a topo for Blown Away?